She is an incredible entrepreneur. Just 10 short years ago, she was living in Korea with her husband and two children managing an IKEA store. That was then. This is now, and the story of Chae and her journey to Han Ba Tang, a Korean-Mexican restaurant that could also be called one of the coolest spots in the GTA. GTA, you say? Hey, the narrow-minded Torontonian is traveling outside of her comfort zone. Most of you know I have an incredibly curious nature and truly will happily travel for food. I sort of feel that the Yonge from Sheppard to Highway 7 corridor is becoming a bit like Brooklyn in that it is becoming quite an interesting food hub. I am going to do my best to describe Han Ba Tang. It is like stepping into a restaurant in Southeast Asia. Corrugated aluminum, a giant stuffed Marlin, neon signs, great wooden tables, everywhere the eye can see there is something eclectic and funky and perfectly positioned. Enter, and to the right and all these large glass cisterns filled with liquid, fruits and herbs, a bit like an apothecary. Ask what they are and you find out that at all times Han Ba Tang have Soju infusions. Soju, is a 35% alcohol fermentation a little like a weak vodka. 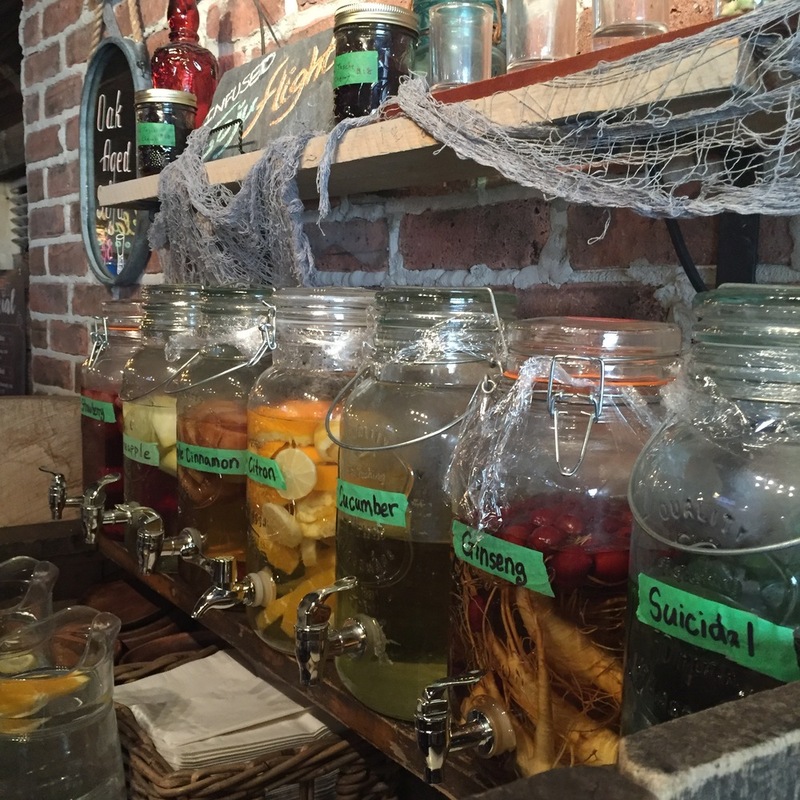 Get a flight of these infusions or a cocktail made with them. I had both. My flavours for the flight were; pineapple, strawberry and ginseng-date. They were all so incredible that I can’t wait to try other flavours. My cocktail was a Tom Collins Kim which is a Collins Cocktail shaken with gin, grapefruit and lemon juices, with a Korean twist of Apple Cinnamon Soju. It was well-balanced yet fruity, and utterly delicious. One of many great cocktails. The nibbles and food began and I listened, fascinated by Chae and her journey. I was presented with a trio of salads that included Chicken Salad with poached shredded chicken, shredded veggies, crispy taro chips and a sweet soy-mustard dressing. A trio of salads - if you want them this way, mention my name. Next: Kalbi salad, rare marinated beef with greens, tomatoes and onions with deep fried onions and a sweet onion dressing. Last on the trio was Ramen salad - a perfect summer salad. Cool ramen noodles with sweet grapes, avocado, bean sprouts and deep fried yuba, tofu skin. Now, here is the secret: this trio is a secret menu item tell them you read about it in my review. At the same time, Chae told me the hows and whys of how Toronto became home. Many many Koreans send their children abroad for school as the schooling is quite poor in Korea. Chae’s sister had done this and came to visit her daughter here. She felt the life here granted kids more opportunity to be kids, whereas in Kore, kids even at the young age of 10 rarely leave school before 8 pm. Chae wanted her kids to have a life where they had friends and sports and were well-rounded. Korea did not offer this and Canada did. Chae and her husband, who was a project manager in advertising, gave up their livelihood, friends, family and so much more to allow their family to spend time together. It is a truly heart-warming story. Chae’s sister has a huge Korean traditional restaurant here and helped Chae learn the ropes. Three years ago, Chae and her husband opened Han Ba Tang and they haven’t looked back. Enter round two: a delicious Spicy Pork Taco on a spinach soft shell. Pork neck was marinated in house made spicy sauce, cubed and stir fried and topped with a shredded cabbage slaw with Kimchi aioli. It was a good taco and the meat was wonderful but it would have been made great with more coriander and the bite of a bit of fresh green onion. I could use 3 or 4 or 5 of these wicked Korean marinated pork tacos stuffed with cabbage slaw, spicy aioli and beyond delicious hot sauce. Chef J.J. is maybe 20 years old, and he is doing a fabulous job under head chef Kevin’s tutelage. He is inquisitive and really wanting to learn, which he does like a human sponge. An interesting young man I look forward to chatting with more the next time I am in. HBT Bossam came next. A spectacle the likes of Saganaki to the Greeks. Succulent pork belly wrapped in perilla leaves covered in a salt meringue, flamed in Soju and served with iceberg lettuce cups and spicy dried apple chutney. It is fun presentation that has all eyes on it but more importantly delicious. Perilla leaves are quite interesting and come in fresh from Korea and are reminiscent of apples and mint. HBT Bossam; Pork belly in perilla leaves flamed in a salt. One thing that Chae said during our three-hour chat and dinner was that, “Canada will take care of me not to be starving.” What I interpreted this to mean was that with hard work, kindness and a vision in Canada, good opportunities can happen. The fourth course was really really cool. During the time of the Korean War as we all know the country was over run with Americans, and this brought its own twists the cuisine. One such dish is Mac and Gochujang with Baby Octopus, which is a crazy cool version of Mac, and Cheese with extra spicy Korean housemade sauce, perfectly cooked baby octopus and assorted cheeses. Let me tell you, this stuff was spicy was so highly addictive. Another dish on the menu is Mr. Johnson’s Soup. I did not try this but again a very interesting study on one aspect of the history of Korea. The soup consists of a weird variety of meats including Spam, sausage, minced beef then cabbage, beef stock and cheddar. I hear it is a must try, I am thinking next winter for this. The best seller are the Kimchi Fries, no great surprise but a funny story behind it. Chae noticed the customers would come in for booze and a few bites but then go to the neighbourhood McD’s for fries. Not to be outdone, she added a Korean version of fries to her menu. It is to be noted that Chae purchased a special Kimchi fridge just for the making and fermenting of the Kimchi used in many of the dishes here. Last up on savouries was Beef Kalbi Jjim is braised beef short rib with Korean dates, dried red pepper thread and boiled walnuts. A rich sweet dish with very interesting flavours. 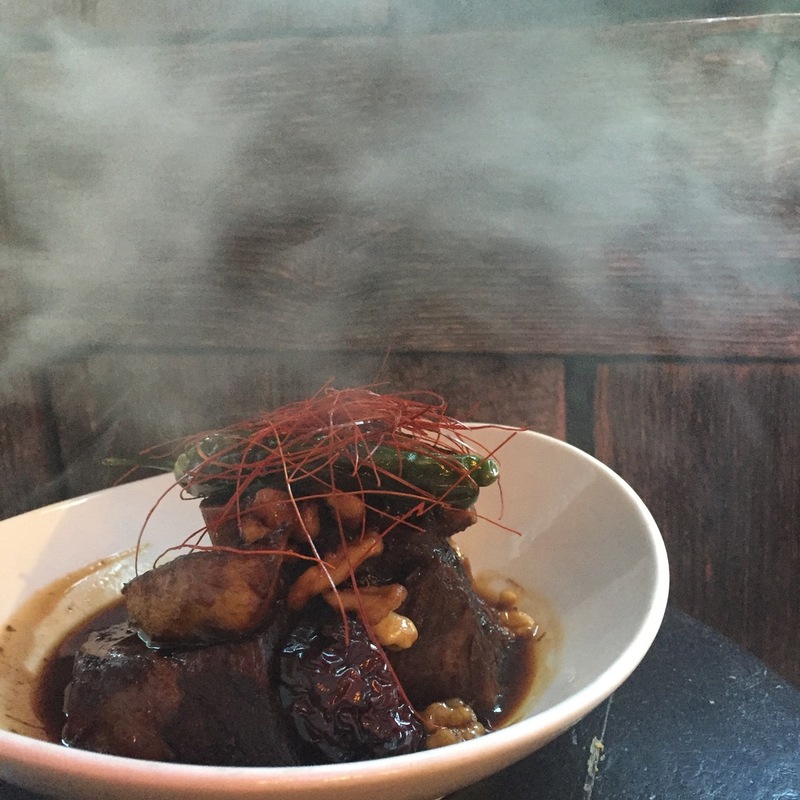 I loved that the kitchen cools the beef, trims away the fat and then braises it. Various kimchi that has been pickling in the fridge. Dessert, at many Asian restaurants, is missing. Truly, I understand that it is not a big thing over there but hey, you are over here now and even first generation Asians who have been here a while are getting used to finishing a meal with a sweet and if you want other demographics then away you go. Do incredible things to finish off the meal the same way it began. Sweet custard and fruit dessert. In Chae’s defense, when this was brought up, she was already recognizing this issue and is working towards creating some interesting summertime hits. Do also go and visit in a month and the summertime menu will be up with more deliciousness on offer. I was honoured to go in depth with this incredibly brave woman and to write about her and her restaurant. Please let me know your thoughts and do say hi to Chae when you are there.